Delicious, affordable, and customized menu options from your friendly caterer in Dallas. Choose A Catering Service That Puts Your Needs First. A catering service can make or break an event. Our team at Caribbia is dedicated to ensuring your next occasion is one to remember. From customized meal options to authentic Caribbean food, our caterer goes above and beyond for your guests. Contact us today and we’ll provide you with further details and costs for our catering services in Dallas. At Caribbia, we know you want to make your next event special. That said, don’t make the mistake of just hiring any run-of-the-mill catering service in Dallas. 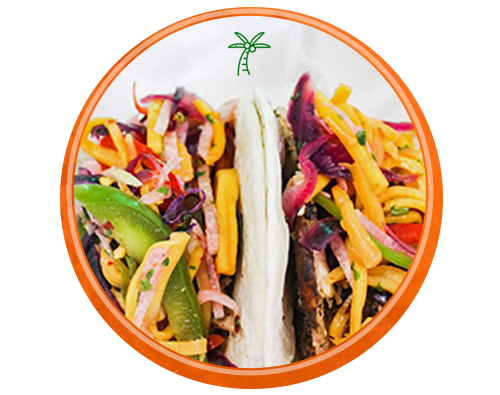 Our caterer is ready to bring the mouth-watering flavors of Caribbean cuisine to your next social or corporate shindig. Learn more about our catering service below. Tired of the same boxed lunches at work? Not interested in serving what guests might consider being “traditional” or “ordinary” food at your wedding? In either case, Caribbia is the answer! We would love the chance to feed you, your team, your family, and your family. With our catering service, there’s no need to worry about cooking the food yourself. Instead, you can relax and enjoy this occasion just like your guests. There’s no question that Caribbean cuisine exploded with flavor. Check out our menu and you’ll see it includes a wide variety of options and customizations, including vegetarian dishes. Whether you’re hosting a party, opening a brewery, or planning a company picnic, the food must be nothing short of exceptional. This is where hiring a top-notch catering service is so important. At Caribbia, we are ready to create a unique culinary experience for your guests. Who wouldn’t want to feel as though they’ve been transported to the white sands and turquoise waters of the Caribbean? Book the Caribbia catering service today.